How Do We Make Continuous Tense in Arabic? How do we make continuous tense in Arabic? E.g "I go to the mosque (= أذهبُ الى المسجد)"
But "I am going to the mosque (= ?)" How can we do such sentences? You reminded me when I began learning English, long time ago, trying to understand (what the hell is Continuous Tense?!!) Then I realized, Arabic and English don't have similar grammars. Some grammars in English but there aren't similarity in Arabic and visa versa. 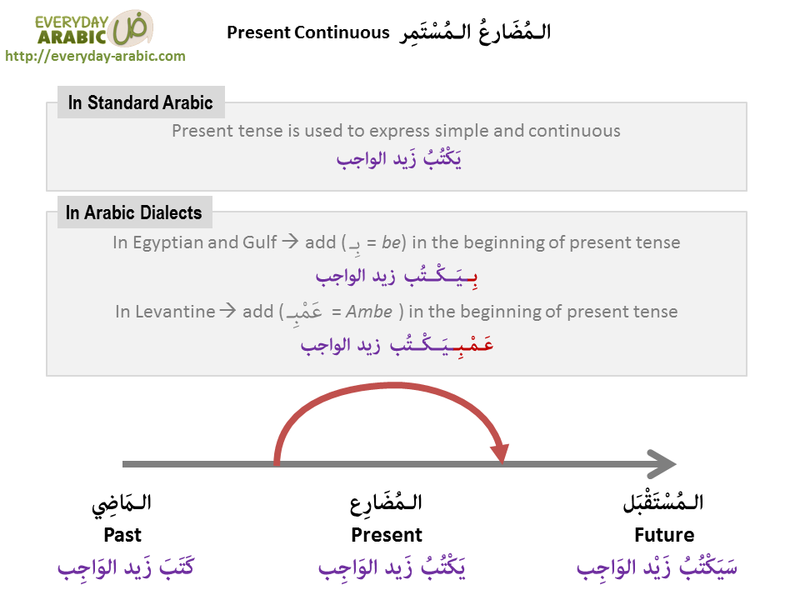 There aren't similarity for Continuous Tense in Arabic but the case is different in Arabic dialects. I'll explain that to you. The meaning can be understood from the sentence or the situation. In daily conversation, present continuous has different form in different dialects. However, not all verbs can be put in the Present Continious. Good examples. That is actually correct. In general, the form اسم الفاعف EsmuFael has the continouse/future meaning. أجلس في مقهى الحي عادة > أنا جالس في مقهى الحي الآن. Thanks, I am new in the Arabic sphere and this concept has been puzzling me for a while. Now I know I simply need to concentrate on present and past tenses since I am studying standard Arabic and not dialects.